The mainly modern burial ground is situated to the north and west of the church and this contains the graves of those buried in the period from approx 1860 to 2007 AD. These are numbered from 1 to 43 and are mainly upright vertical headstones and primarily mark the graves of the families and their descendants that settled on the island in 1840s. It would seem that the island did not suffer any deaths during the famine as the earliest recorded inscription is for Mary Scanlan who died aged 18 on the 17th July 1861 and is buried in grave number 28. 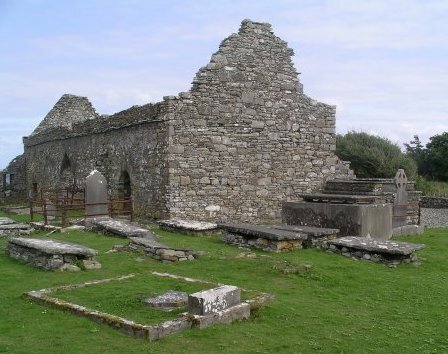 The older burial ground located within the church numbered 96 to 131 and to the south and east of the church numbered 44 to 95 contains graves mainly of people who did not live on the island but desired to be buried on holy ground. These are usually flat horizontal flagstones or tombstones but also include five vaults. (No 32, 34, 58, 82 and 95). The Board of Guardians of the Kilrush Union as a Burial Board will on Saturday the 16th August next receive and consider proposals for the erection of a stone wall at Burial grounds of Shanakyle and Scattery Island. The work to be executed in accordance with a specification to be seen at my office and security required for the due performance of the contract within a limited time. By order: A Warren, Clerk of Burial Board, and 2nd August 1879. Behan (1) 1845, Brennan (6) 1862, Brew (1) 1830, Callinan (1) 1922 ,Conway (1) 1846, Comyn (3) 1832, Culligan (1) ?, Cusack (4) 1854, Griffin (2) 1895,Grogan (3) 1822, Hannan (1) 1875, Hanly (1)1816, Harris (1)1900, Hassette (2)1837, Hehir (2)1815, Kennelly (1)1863, Lillis (2)1811, Lynch (1) 1835, McAllen (1) 1911, McMahon (5) 1885, MacMahon (1) 1840, Mahony (7) 1830, Martin (1) 1873, Meagher (1) 1876, Melican (6) 1894, Moloney (1) 1837, Moran (5) 1805, Nolan (2) 1819, O'Donnell (1) 1840, O'Neill (3) 1821, Rochford (1) 1821, Ryan (1) 1811, Scanlan (9) 1837, Spenser (2) 1819, Tierney (1) 1881. Tierney (No 11 Kilrush), Callinan (No 22 Kilrush), Comyn (No 32 Kilrush Vault), Culligan (No 33 Ballynote), McMahon (No 44 Leadmore), Martin (No 45 Cappa), O'Neil (No 46 Kilrush), Hanly (No 50 Kilrush), Conway (No 51 Kilrush), Nolan (No 61 Ballyket), Mahony (No 68 Kilrush), Lillis (No 77 Gower), MacMahon (No 82 Kilrush Vault), Meagher (No 112a Bathurst, Australia). The inscription on grave number 77 (Lillis) includes the narrative “who lived respected and died regretted” an inscription perhaps all should aspire to achieve. A manuscript (MS 16415) in the National Library of Ireland for a John Comyn Kilrush dated June 7th 1845 contained only poems and witty newspaper cuttings from the first half of the nineteenth century and were not in any way related to James Comyn (Vault/Grave No 32). However this may be the same John Comyn who erected the gravestone on grave number 89 for his daughter Bridget who died in 1854. An old photograph c 1890 revealed more details than are currently on the stone of vault number 32 and those details are included in the memorial inscription. It would appear that the old polished stone was turned around when it was fully inscribed and the now unpolished side was used for the later inscriptions. John Grogan (No 34 Vault) Michael Hassett (No 58 Vault) Edmond Mahony (No 95 Vault). An examination of TAB's index for Kilrush shows a John Grogan, three Michael Hassetts and three Edmond Mahonys as residing in Kilrush or nearby townlands. An examination of Griffith's index shows that there were three John Grogans, two Michael Hassetts and no Edmond Mahony resident in Kilrush in 1855. Gravestones for Scanlan (No 6) Brennan (No15) McMahon (Nos 16 & 31) Melican (No 19) and Moran (No 42) have “Died” or “Lost at Sea” noted on the inscription. on any apparent gravestones to mark their passing. Tierney: Ó Tighearnaigh. There were three septs of this name, in Donegal, Mayo and Westmeath but these are now scattered. It is much confused with Kiernan in Mayo. 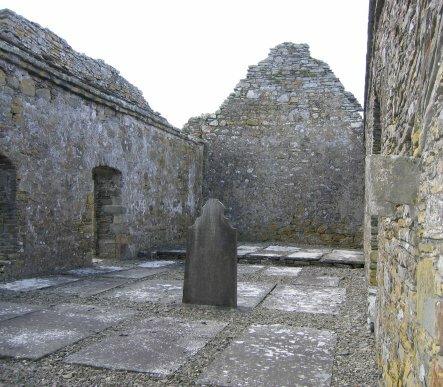 (Grave number 11 the deceased was a Christian Brother in Kilrush). Scattery Island. Last week the Bishops of Kerry and of Limerick Right Rev Dr Moriarty and Butler visited the historic and picturesque island of Scattery. Their Lordships were accompanied from Kilkee by the Very Rev Dr O’Brien, Dean of Limerick, Dr O'Shea VG of Rathkeale and Rev J Malone. It is said that they deciphered several inscriptions on tombstones that were deemed almost illegible heretofore. In the evening their Lordships were most hospitably entertained by the Very Rev Dr Kelly VG and PP (Kilrush Gazette). A Plan of Scattery Graveyard is given in the next section and should be used with the following memorial inscriptions. BEHAN 57 IHS, Erected by Pat Behan in memory of his mother Mary Behan alias Griffin who died March 16th 1845 aged 78 years. May her soul RIP amen. BRENNAN 14 Erected by Bridget Brennan Scattery in loving memory of her beloved husband Patrick Brennan who died April 10th 1927 aged 74 years. Sweet Jesus have mercy on his soul. BRENNAN 15 In loving memory of John (Jack) Brennan died 24th Oct 1958 aged 72 his wife Maria died 11th Oct 1945 aged 56. Their son Gerard died at sea also Felix and Kathleen. RIP. BRENNAN 35 IHS, Here lie the remains of Patrick Brennan of Scattery who died May the 28th 1863 aged 77 years also his beloved wife Ellen Brennan alias Melican who died September the 24th 1862 aged 79 years. May their souls RIP amen. BRENNAN 36 IHS, Erected by Felix Brennan of Scattery in memory of his beloved son Sinon Brennan who died April 26th 1876 aged 19 years also his brother John Brennan who died December 11th 1881 aged 13 years RIP amen. BRENNAN 39 In loving memory of Edmond Brennan of the Dublin Metropolitan Police who died 1st May 1900 aged 27 years. BRENNAN 40 Erected by Patrick Brennan of Scattery in memory of his beloved son Michael Brennan who died November the? 1880 aged 19 years may he rest in peace. BREW 121 Here lies the remains of Bridget Brew who depd this life January 2nd 1850 aged 32 years. Erected by her father John Comyn for him and posterity may her soul rest in peace. CALLINAN 22 In loving memory of my dear husband John Joseph Callinan MD who died at Kilrush 16th April 1922 aged 57. COMYN (vault) 32 Erected by Mrs James Comyn Kilrush in memory of her husband who died 14th May 82 also children John died August 7th 1843,Michael died February ? ?, Kate died October ? ?,Mary Anne died March ? ?,James died February ? ?,Susan Slattery alias Comyn may they rest in peace. COMYN 122 Erected by John Comyn in memory of his mother Margaret Comyn alias McMahon who died May 2nd 1832 aged 74 years, also his father John Comyn of Ballynote who died December 8th 1844 aged 98 years may his soul rest in peace amen. COMYN 89 Erected by John Comyn in memory of his beloved daughter Bridget Comyn who departed this life October 21st 1854 aged 13 years may her soul RIP? CONWAY 51 IHS, Erected by the Kilrush Christian Doctrine Society as a testimonial of respect to their beloved member Michael Conway who died April 27th 1846 aged 26 years may he RIP amen. CULLIGAN 33 Sacred to the memory of Sinon Culligan, Ballynote, who departed this life 7th Augt. 1845, aged 60 years, and Mary his wife who died 7th Feby. 1873, aged 66 years. Timothy Culligan died March 26th 1912 aged 78. Bridget Culligan died April 11th 1920 aged 86. Requiescant in pace. CUSACK 84 Erected by John Cusack in memory of his father Thomas Cusack who died September 22nd 1854 aged 59 years also his mother Susan Cusack alias Moran who died August 17th 1859 aged 55 years. CUSACK 125 This tomb was erected by John Cusack in memory of his beloved son Patrick Cusack who depd this life January 20th 1832 aged 29 years may his soul rest in peace. CUSACK 115 This tomb was erected by Mary Cusack alias Boland in memory of her beloved husband Michael Cusack who died January 20th 1862 aged 48 years may his soul rest in peace. CUSACK 128 This tomb was erected by Michael Cusack in memory of his father who died and his brother who died in 1819. GRIFFIN 1 Erected by Hanna Griffin in memory of her husband Sinon Griffin died 1895 aged 49 years(son) Michael died Feb 28th 1918 aged 49 years, Mrs Mary Griffin died Nov 16th 1918 aged 45 years her son Patrick died Nov 17th 1918 aged 15 years. RIP. GRIFFIN 2 In loving memory of Michael Griffin Cappa, Kilrush died 5th Feb 1945 aged 47 years, his wife Maria Griffin died 2nd Nov 1984 aged 74 years RIP. Erected by their families. GROGAN (vault) 34 IHS, Erected by John and Mary Grogan in memory of their beloved children Patrick who died June 1877, John ???? 1879, Maggie April 30 1881, Stephen April 11th 1896. GROGAN 119 Erected by Stephen Grogan for his daughter Mary who died November 1st 1822 aged 15 RIP. GROGAN 118 Erected by Stephen Grogan for his son Sinon Grogan who depd this life December 10th 1830 aged 30 years. HANLY 50 IHS, erected by Daniel Hanly of Kilrush in memory of his father Daniel Hanly who departed this life July 14th 1816, may his soul rest in peace. HANNAN 70 Erected by Patrick Hannan? ?Who died October 17th 1875 aged 60 years may he rest in peace amen. HARRIS 23 Erected by John Harris in memory of his beloved children James, William, James and Patrick also John who died 23rd August 1900 aged 34. May their souls rest in peace. HASSETT (vault) 58 Michael Hassett (in Irish O'Hassie) died in 1908 aged 98 years may his soul rest in peace. Mrs Mary Hassett who died Dec 31st 1905 aged 76 years. HASSETTE 94 Erected by Bridget Hassette alias Mahony in memory of beloved husband Michael Hassette January 5th 1837 aged 50. HEHIR 27 Erected by Jerry Hehir in memory of his daughter Bridget also his brother Michael died Aug 20th 1916 aged 50 years, Jerry Hehir died June 10 1922 aged 72 years, Margaret Hehir died Jan 28 1955 aged 81 years. HEHIR 63 Here lies the body of Daniel Hehir who died September 8th 1815 aged 36 years may he RIP amen. Erected by his beloved father Jeremiah Hehir for him and posterity. KENNELLY 80 Erected by Thomas Kennelly in memory of his beloved son Timothy Kennelly who departed life December 13th 1863 aged 22, may his soul RIP. LILLIS 77 This tomb was erected by Bridget Lillis in memory of her beloved husband Mr James Lillis of Gower who lived respected and died regretted July 30th 1828 aged 47 years, may he RIP amen. LILLIS 78 This tomb was erected by Mary Lillis alias Culligan in memory of her beloved husband Mr Paul Lillis who died April 13th 1811 aged 63 years, may he RIP amen. LYNCH 49 Here lie the remains of Miss Ellen Lynch alias Sul-vn who departed this life 24th December 1835 aged 55 years and also her husband Thomas Lynch died August 1850 their son Michael Oct 1887. MAHONY 108 Erected by Michael Mahony in memory of his father David Mahony who depd this life March 6th 1837 aged 78 years may his soul rest in peace amen. MAHONY 68 Erected by Mr Denis Behan in memory of his beloved uncle Edmond Mahony of Kilrush who died February 21st 1840. MAHONY (vault) 95 IHS, this vault was built by Mr Edmund Mahony in memory of his mother Mrs Catherine Mahony alias Stacpoole who died December 16th AD 1830 aged 50 years RIP amen. MAHONY 97 This monument was erected by Mary Mahony in memory of her beloved mother Bridget Mahony who departed this life August 29th 1856 aged 57 years may her soul RIP. MAHONY 98 This tomb was erected by Patt Mahony in memory of his beloved brother Martin Mahony the mate of the Brig Agnes Timothy O'Gorman master who departed this life the 1st of November 1830 aged 29 years, may he RIP amen. MAHONY 103 Erected by Mary Mahony alias Brown in memory of her beloved husband Michael O'Mahony who died March 4th 1843 aged 66 years, may he RIP amen. MAHONY 106 Erected by Michael Mahony in memory of his father Nicholas Mahony who depd this life 27th February 1837 aged 73 years. MARTIN 45 Erected by Bridget Martin in memory of her beloved husband John Martin Cappa, who died March 2nd 1873 aged 80, may he in posterity RIP amen. Bridget Martin, daughter Bridget, Catherine Walsh, James Walsh RNVR. McALLEN 43 Erected by Margaret McAllen in memory of her late husband Robert McAllen who died June 4th 1911 aged 48 years. McMAHON 16 In memory of Mary Theresa McMahon died 30th June 1937 aged 14 years, Michael lost at sea 1940, parents Sinon McMahon died May 1973 his wife Nora died 15th Sept 1985. McMAHON 30 In loving memory of the sons of the late Austin and Bridget McMahon Scattery, Michael died 19 June 1975 aged 66 years, Austin (Bobby) died 13 Jan 1979 aged 55 years RIP. McMAHON 31 In loving memory of Austin McMahon Scattery Island died 4th Dec 1953 aged 73 years, his mother Bridget McMahon died 23rd Nov 1925 aged 74 years, his son Stephen died at sea 22nd Oct 1940 aged 29 years also Christina Alice and Anthony who died young his wife Bridget died 16th Sept 1966 RIP. Erected by his wife Bridget. McMAHON 44 IHS sacred to the memory of Michael McMahon of Leadmore who died Sept 16th 1851 aged 72 yrs also his wife Johana McMahon alias Grogan who died Sept 17th 1856 aged 60 erected by their daughters Margaret and Johana McMahon. McMAHON 76A Erected by Michael McMahon Scattery Island in loving memory of his father Austin McMahon who died April 5th 1885 aged 83 years also his mother Mary McMahon who died August 11th 1879 aged 70 years. MEAGHER 112A Erected by John Meagher Bathurst Australia to the memory of his beloved mother Kate Meagher alias Mahony who died 11th August 1876 aged 75 years. MELICAN 19 Erected by Christenia Melican in loving memory of her husband John Melican who departed this life November 21st 1913 aged 31 years. May he rest in peace. Christine Melican died 16th October 1931, sons Peter (lost at Sea) 12 April 1943, and Michael died 29th February 1965. MELICAN 20 Sacred heart of Jesus have mercy on the souls of John Melican who died 22nd April 1924 aged 37 years and his wife Catherine who died 14th Dec 1954 aged 64 years, their daughter Anne died 26th March 1999. May they rest in peace. Erected by their loving family RIP. MELICAN 21 In loving memory of Michael Melican Scattery Island son of the late John and Catherine Melican died 20 July 1979 aged 57 years RIP. MELICAN 24 Erected by John Melican in memory of his father Michael Melican who died February 20th 1897 aged 47, also his mother Brid Melican who died February 20th 1897 aged 37 years and his brother Michael died February 20th 1897 aged 17 years. May the Lord have mercy on their souls. MELICAN 25 Erected by Michael Melican in memory of his beloved parents John Melican February 18th 1894 aged 86 years, Bridget Melican alias Brennan November 9th 93 aged 73. May they RIP amen. MELICAN 26 Erected by Johanna Melican in loving memory of her husband John Melican died Oct 18th 1920 aged 65 years, also her son Stephen. MOLONEY 129 Erected by Catherine Minetor alias Moloney in memory of her beloved husband Pat Moloney who depd this life March 8th 1837 aged 48 years. Death takes the good, too good in faith to stay and leaves the bad for God to take away. MORAN 5 In loving memory of Thomas Moran died 23rd Aug 1957 his wife Nora died 12th May 1957, also their sons Patrick, John, Thomas and daughter Mary RIP. Erected by Alice. MORAN 10 In loving memory of John Moran died 15 May1955 his wife Kate died 25 May 1955. RIP. Erected by their daughter Delia Scanlan. MORAN 38 Erected by Patrick Moran in memory of his wife Margaret Moran who died February 2nd 1905 aged 63 years. May her soul RIP. MORAN 42 In memory of Sinon Moran Cappa died at sea Oct 6th 1914 aged 37 years, his wife Anne died Dec 23rd 1954 aged 72. MORAN 79 Here lies the remains of Catherine Moran alias Carberry who closed her mortal career February 1st 1805 aged 34 years; also her beloved husband T Moran September 25th 1821 aged 52. Erected by their son Pat Moran. NOLAN 54 Erected by Anthony Nolan senr for his beloved wife Mary Nolan alias Brew who departed this life April 26th 1822 aged 68 years. O'DONNELL 60 Erected by Captain P O'Donnell in memory of his beloved father John O'Donnell who died September 21st 1840 aged 60 years. May he RIP amen. O'NEIL 17 Erected by her beloved parents in memory of Minnie Agnes O'Neil died 4th Jan 1884 aged 9 years. O'NEIL 46 Erected by Mary O'Neil in memory of her beloved husband Patrick O'Neil of Kilrush who died on 5th day of November 1836 aged 45. May his soul RIP amen. 0'NEIL 47 Erected in the memory of Mary O'Neil alias Foarhan by her affectionate brother Batt Foarhan .She died in 36th year of her age August 4th 1821 RIP amen. ROCHFORD 96 Erected by Edward Rochford in memory of his beloved father John Rochford November 22nd 1821 aged 60. RYAN 48 This tomb was erected by Mary Ryan in memory of her beloved husband. George Ryan who departed this life March 15 1811 aged? SCANLAN 102 Erected by Alisha Scanlan in memory of her mother Mary Scanlan alias Lynch who depd this life 30th December 1837 aged 70 years may her soul rest in peace amen. SCANLAN 3 In loving memory of Michael Scanlan died 11th April 1941 his wife Ellen died 25th May 1960, RIP. SCANLAN 4 In loving memory of Patrick Scanlan, Ennis Rd Kilrush, died 1 Oct 1973, RIP, erected by Pauline and family. SCANLAN 6 Erected by Patrick Scanlan, Scattery Island, in memory of his son Sinon Scanlan who died at sea Oct 1925 aged 39 years, also his son John Scanlan who died young. SCANLAN 7 Erected by Michael Scanlan,Scattery Island,in loving memory of his son Sinon who died July 21st 1925 aged 11 years also his parents Ellen Scanlan who died December 28th 1935 aged 82 years and Sinon Scanlan who died 28th March 1935 aged 82 years. Sweet Jesus have mercy on their souls. SCANLAN 9 In loving memory of Patrick Scanlan who died 9th Sept 1962. SCANLAN 18 Erected by Sinon Scanlan in memory of his son Sinon died June 12th 1925 aged 38 years also his daughter Agnes. SCANLAN 28 Erected by Michael Scanlan of Scattery in memory of his beloved daughter Mary Scanlan who died July 17th 1861 aged 18 years. May the Lord have mercy on her soul. SPENCER 59 This tomb was erected by Mr John Spencer in memory of his two beloved daughters viz. Johanna who departed this life September 28th 1819 aged 7 years also Bridget who departed this life December 22nd 1819 aged 17 years. May they RIP. SPENCER 53 IHS Erected by Ino Spencer chief mate of the Valdelure cutter over the remains of his daughter Johana Spencer who died Sept 26th 1819 aged 2 years.